Abstract. Conceptual climate models provide an approach to understanding climate processes through a mathematical analysis of an approximation to reality. Recently, these models have also provided interesting examples of nonsmooth dynamical systems. 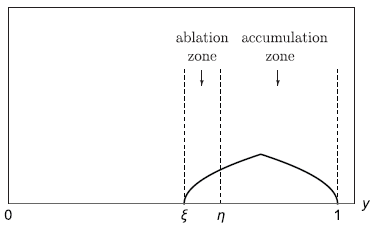 Here we develop a new conceptual model of glacial cycles consisting of a system of three ordinary differential equations defining a discontinuous vector field. Our model provides a dynamical systems framework for a mechanism previously shown to play a crucial role in glacial cycle patterns, namely, an increased ice sheet ablation rate during deglaciations. We use ad hoc singular perturbation techniques to prove the existence of a large periodic orbit crossing the discontinuity boundary, provided the ice sheet edge moves sufficiently slowly relative to changes in the snow line and temperature. Numerical explorations reveal the periodic orbit exists when the time constant for the ice sheet edge has more moderate values.